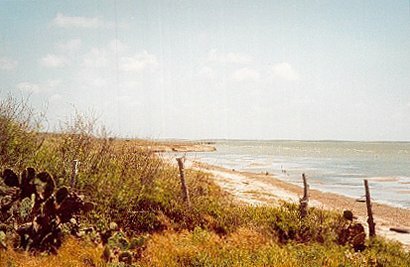 Theodore Koch purchased the land around present Riviera from the King Ranch in 1907. He established the town of Riviera on the St. Louis, Brownsville and Mexico Railroad tracks. Koch had actually visited the French Riviera and evidently had fond memories (and a good imagination) for that's what he named it. A couple from Chicago built the first house, but the climate didn't agree with the wife. They left and Koch moved in and ran the building as a hotel. 1910 brought the new bank building and a telephone system. The telephone exchange was operated out of a private residence. Why? Because that's the way they did things in 1910. The exchange didn't move until 1975. Koch's plan was to develop both Riviera and Riviera Beach. The two were at first connected by a simple dirt road, although a landscaped boulevard was planned. 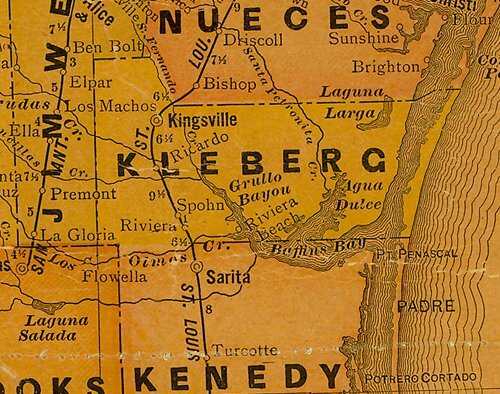 In 1912 Koch had a railroad line extended from Riviera and the futures of both towns looked bright. The train ran several times per month, bringing prospective land buyers and future residents. It also resulted in the development of the town of Vattman. By 1916 Riviera Beach had a park designed by a florist. Not just any florist, but one imported from Pasadena, California. The resort's infrastructure was excellent, but a seven-year drought ruined things. Then a hurricane blew in on August 16, 1916 and Riviera Beach was nearly wiped away as clean as Indianola. They rebuilt, but things were never the same. Riviera did survive, however, and finally got around to incorporating in 1964. 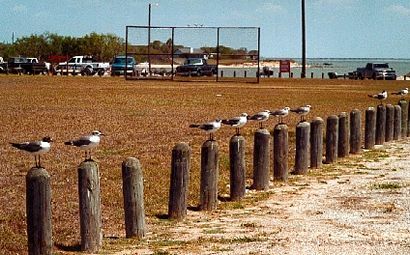 Riviera Beach connects with Loyola Beach just a few miles north, and for birders, this is where they'll find Kaufer-Hubert Memorial Park. 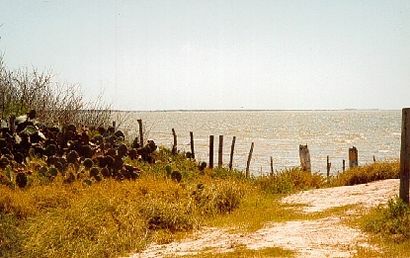 You can then return to Hwy 77 by FM 628 that passes the former town of Vattman, Texas.